So you may or may not know that I suspended my Facebook account, deleted my Twitter account, and also deleted my Strava account this week. This blog is intended to address some of the reasons why. I also deleted my Instagram account, but when I saw how heavily my blog is tied into it and also because I wanted to be able to see pictures my family posts, I restored that account. As a short summary, the stress of online interactions and wondering when would be the next time I would have to defend my ride data led me to delete my Strava account with my Facebook and Twitter accounts going down as collateral damage. I still haven’t sorted everything out, and to try to explain it in a short summary is pretty much impossible. I can, however, summarize why Facebook and Twitter were collateral damage. Because of Strava’s Instagram integration feature which I used to try to prove the legitimacy of my rides and where I was riding and what I was doing, I found it easy to also cross post to Facebook and Twitter. I got to the point where I was posting too much on Facebook and Twitter and pushing away real life friends from me. So I deleted Facebook and Twitter first on Wednesday of this past week and thought I would hold onto Strava a bit longer, maybe for all of 2016. But then that very same day, there were negative doubting comments following up on the heels of questioning comments last week, and in an emotional reaction I said “forget that”, I don’t need this in my life. Good-bye. That’s the best I can do in a short summary, and it doesn’t really paint the entire picture – so if you want that, then you might want to grab a cup of coffee. This is a long post, which has taken a long time to write. Some of the times I say “today”, “yesterday”, “this week”, etc… may be confusing. For reference, I started the blog on Wednesday, January 30th. My parents helped me unload the car and unpack all my stuff into my dorm room. Then they said goodbye and drove back home to Alabama. I was on my own for the first time, and I was a bit homesick immediately as my mom was crying when she said goodbye and drove off. But then with nothing else to do, I hopped on my bike and headed straight out towards the mountains. As soon as I saw the first blue ridge peaking up in the distance, I knew I had found my home. The Clemson Cycling team was a great group of guys, and we had lots of fun together. Bert Hull and I shared many an adventure together – I can recall one brutally hot ride out to Sassafras Mountain and back where we were very much delirious from heat exhaustion. Bert ended up taking a break at a gas station near the end and I just kept on going completely out of it. In general though, I frequently went out on long rides into the hills and mountains during the middle of the week all by myself. I would have these crazy adventures, see crazy things, and then when I came back I didn’t always have somebody I could share the adventure with. And when I did find myself recounting adventures, I always wondered in the back of my mind whether anybody believed all the stuff I was doing. As far as data goes, I tracked my riding initially on a single poster board for the entire year (see pic below) in 1995 and 1996 using the Eddie Borysewicz method described in his training book. 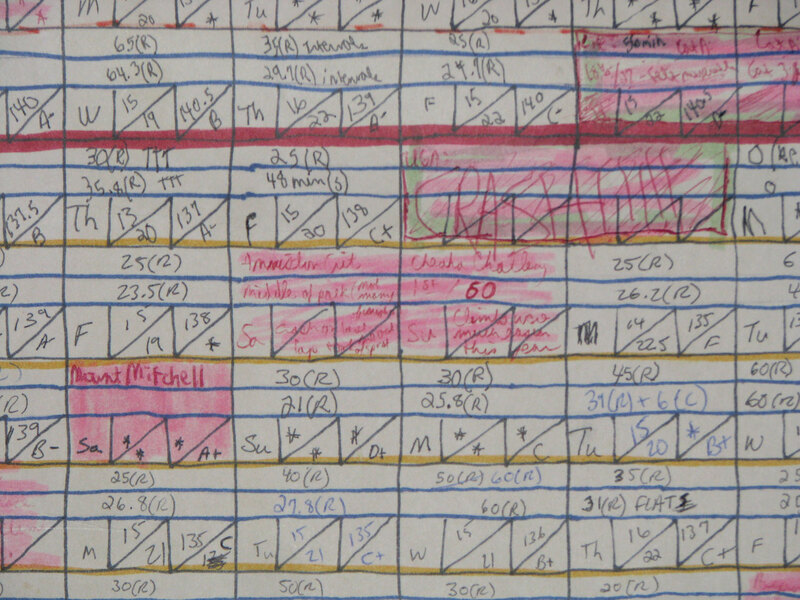 By 1997, I had created a database for tracking my training and racing. I used this all the way through the end of my undergrad career at Clemson. Screenshot highlighting some 1997 entries from my database of racing. I kept a separate training database. I grew up in Birmingham, but moved to South Carolina for my undergrad at Clemson, and moved to California for 6.5 years of grad school to get my Masters and PhD at UC Davis. I was very busy, and my life was a mess out in California so I didn’t ride much. But I rode a few times all the way out to the hills, eventually discovering Mix Canyon and climbing that a few times over the course of several years on adventures that were especially epic since I was out of shape. I also made my way all the way out to Knoxville Rd with its yellow “curves ahead next 39 miles” caution sign on the backside of Lake Berryessa. I raced a few times and ended up winning a Cat B road race in Nevada (my only ride in Nevada at the time). California was great, but when we moved back to Birmingham literally on January 1, 2005, it was perfect timing as all my riding to get around town everywhere in Davis, California had prepared me to explore Birmingham on my bike. And what I found beyond the flat valley roads that group rides tend to favor just amazed me. I still vividly remember that first ride I did from our house, up past Vestavia Hills High School, into Vestavia Hills city center, and then across Canyon Rd to Shades Mountain Baptist Church where I had to turn around to be back home on time. I was absolutely amazed at the hills and the climbs and the descents. I came home full of excitement with all the possibilities right out my door. Pretty quickly, I became interested in topographic maps because I wanted to know exactly the heights of each ridge, see which ridge was higher, and measure and compare the steepness of the climbs and descents. There is a spot close to my house I pass on nearly every ride where you can look up and see two steep ridges stacked on top of each other, and I remember very specifically one day thinking to myself “I want to know exactly the elevation of each ridge”. My only experience with topography was the printed USGS topographic maps that I was given by a graduating Clemson Cycling team senior at the end of my freshman year. So I looked online to see if you could see those printed maps online. Keep in mind this was 3 years prior to the invention of Google’s terrain view. I found a website that allowed you to download the USGS topo maps. I also noticed that you could download USGS elevation datasets. I was wondering what that was, and this quickly led me to a program called GlobalMapper, which could be used to display those elevation datasets. 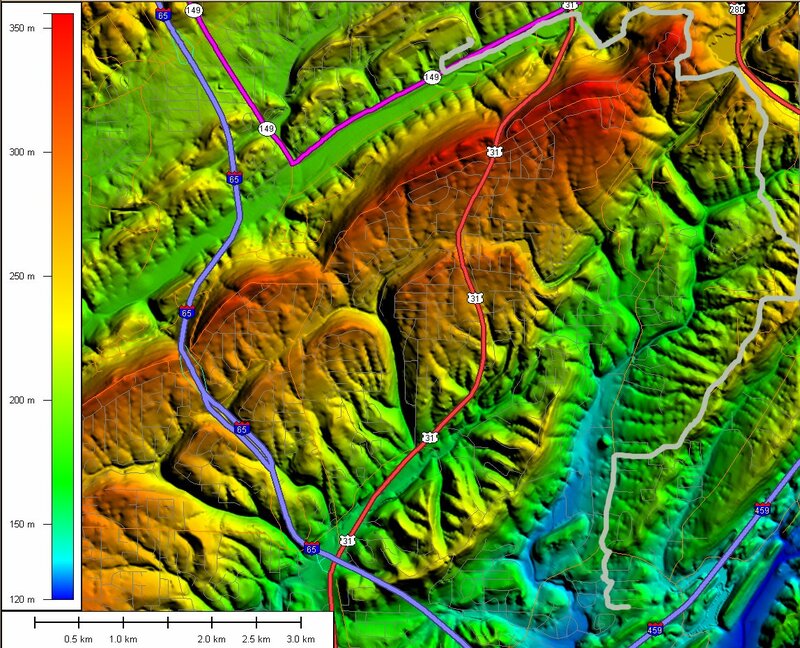 It was exactly what I was looking for – with one quick glance, I could see and compare elevations based on color rather than having to squint at topographic contour lines and count the lines to see which part of the map was higher. Here is a map I created in April 2005 using GlobalMapper showing one of my commute routes into Samford. I didn’t have a cycling GPS so I made the base map using GlobalMapper and then used Photoshop to trace a line on top of the roads I took to get to Samford. By 2007 I was tired of the clunky interface for drawing paths in GlobalMapper and inspired by tools like GMap Pedometer, so I proposed an online mapping application to be the class project for the Fall 2007 Software Engineering I was teaching. We did a lot of brainstorming and got started on an application, but I ended up rewriting everything the following Spring and Summer eventually launching a beta version of topocreator.com where I could create color-coded topographic maps that showed the elevations of ridges and valleys as well as create routes in a similar fashion to GMap Pedometer using the Google Maps API. In 2007, I joined the Tria Market Cycling Team and dove back into racing – racing a huge number of times finally earning enough points to get the upgrade to Cat 1 so I could race in the Pro/1 races by the end of the year. I had a Polar heartrate monitor and was using Polar Protrainer to track my training and racing. I could see how many miles, how much time, and my time spent in various HR zones using the Polar protrainer software. I felt that a cycling GPS was too expensive and unnecessary because I was so focused on my racing that the “adventure” aspect had slid to the background. Oh how I wish now that I had picked up a Garmin Edge 205 back in 2006. With the release and popularity of the Garmin Edge 705, I started to think about getting one motivated in part by how my racing was taking me all over the country and I wasn’t able to keep track of where all I was riding. My first ride with the Edge 705 was in La Porte, Indiana visiting family during Thanksgiving 2008. I built an import tool on topocreator.com where I could import data and see elevation profiles and topographic maps (see example map below from the 2009 Bull’s Gap time trial). You could tag rides and maps, and I began to build a catalog of all the places I was riding and seeing the topographic data in great detail using the color-coded shaded relief maps. A few months later, my friend Jacob Tubbs sent me a link to Strava saying it was a really cool website where you can compare your times on climbs. Back then Strava had a bulk import option so I imported all my rides from the past several months into Strava. My initial connection to Strava was the KOMs. I thought it was really cool that I could try to get the fastest time up a climb and see how fast other people were doing the same climb. I found this to be a great motivational tool for training and one of the things that always surprised me was that I would frequently hit my max heartrate for the week, month, year, etc… going for a KOM on a climb rather than during the middle of a race. That of course is partly because racing is all about conserving energy, and training is all about expending energy (either a lot of it or as little as possible aka recovery). Since there were only a few people on Strava in Birmingham, it was pretty easy to get KOMs. But even then, I could compare my own times on any climb around town. 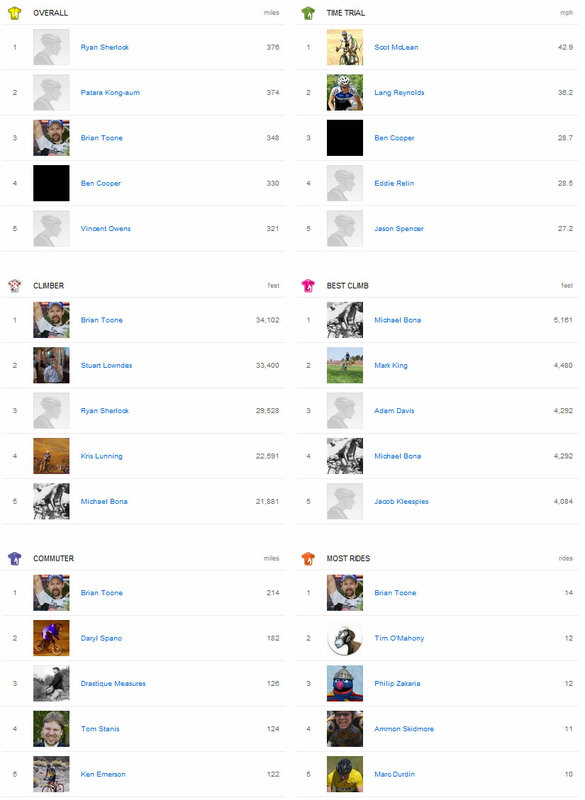 Several years ago, Strava didn’t have club leaderboards. Instead, there was one global weekly leaderboard split up into a few categories. I always tried to see if I could get to the top of the leaderboard within my normal training and commuting regime. Over the years as I was consistently near the top of the Strava leaderboards, I received all kinds of positive comments and notes from people all over the world. So even as early as 2010, I was starting to realize the potential for Strava to be a platform where I could share all the cool riding I was doing here in Alabama. By 2014 when I began training for the Race Across America, I made this one of my primary training objectives – showcase the state of Alabama and how amazing it is to ride here. Here was my 2015 training and racing, note how I hit so many counties in Alabama. topocreator.com map of all my rides in 52 of Alabama’s 67 counties. This map also includes rides that started at home and went into neighboring states of Mississippi, Tennessee, Georgia, and even Kentucky. 30,000 miles of riding in 2015 – annotated US county map. 23 states and 203 counties covered in 2015. Click to enlarge. With all the miles I was putting in for training and all the crazy routes I was picking, I was on top of almost every leaderboard and on top of that my connection with Strava became deeper because here was a place I could share all my adventures with the world and see adventures that other people were having. Also, here was a place where I could upload objective proof of my adventures. One of Strava’s slogans is “Prove it”. So perhaps this is enough to explain my deep visceral reaction to comments this week, last week, the week before that, and off-and-on over the past few years relating to the accuracy and believability of my data. This past week our rabbit died, and I was not in a very good emotional state. So my reaction to the latest comments was pure emotion rooted in an emotional subconscious realization that the very reasons I connected with Strava were no longer valid. Sure, the majority of people probably (although I’m not sure) believed my data without giving it a second thought. But there has always been a number of people who doubted my stats, my rides. That was evident even from 2009 and 2010 where one respected rider from the mountains of Switzerland questioned my climbing saying that when he uploaded my rides to mapmyride.com (notorious for horribly filtered and flattened elevation data) that he would see a drop of 30-40% of total climbing. Whereas if he uploaded his ride from high in the mountains, he would only see a small drop in elevation. We went back and forth with his last comment being something along the lines of a sarcastic “you’ve always got an explanation for everything”. Then at some point in Spring 2011 when I was winning a lot of the brand new monthly climbing challenges and running away with the yearly climbing challenge, I remember somebody tweeting at my twitter account accusing me of being a Strava doper in the middle of a long race weekend. This upset both me and my wife who told me about the tweet as she was looking at twitter. Beyond that, I would get a comment here or comment there, a ride flagged here, a ride flagged there and find myself in a position of defending myself and my ride. Then came the Strava / Instagram integration, and I realized that I could take a picture of my Garmin after every ride and post it with the ride as even more proof. This was perfect. My rides stopped being flagged. The doubtful questioning negative comments stopped for the most part. But then for some reason those comments started up again in 2015 with people wondering about the accuracy of my Garmin since they could see from my pictures that I wasn’t manipulating the ride file. It was annoying all last year. And then this year, last week, when our rabbit died in the middle of a pleasant but passive aggressive interaction with a rider from San Mateo, California I was pretty upset. Then on Wednesday of this week, a different rider from Oregon just flat out said “There is something wrong with your Garmin” on a ride I had done two weeks ago. I’m sure there was no malice intended by either of these people, but for me it was the proverbial “straw that broke the camel’s back”. My interactions with Strava had morphed to the point where I would be checking Strava constantly and dreading new comments on my ride and whether they would require me to defend the accuracy of my ride. Sure, that may be a personal problem I have … I should have just ignored those comments and let people believe what they want to believe. But remember that one of my connections to Strava was the ability to “prove” that I really had ridden across the state and back, that I really had climbed the height of Mount Everest on a single ride, that I really did ride right through the middle of the woods, etc… Sometimes I find myself in the middle of nowhere and can’t believe myself what I am out there doing, so having these comments on Strava directly undermined that connection to Strava I had made back in 2009 when I created an account. Strava was no longer a platform where I could prove my rides – instead Strava became a platform where other people could doubt and question my rides and either directly or indirectly accuse me of cheating at the online challenges. So, on Wednesday after the latest comment which I saw in the break between teaching my first and second classes that morning at Samford, I resolved to quit Strava by the end of the year. I had already deleted my Facebook and Twitter account earlier that morning (see next section). Then after a second comment after that next class, I realized I was done with it. I made a short post on the Million Foot climbing club, which was my favorite club on Strava, initiated a backup of my data and once that completed – deleted my account. Perhaps a more reasonable solution would have been to remove myself from all challenges and clubs so the “doubters” wouldn’t have a reason to stumble upon my account. In retrospect, I wish I had done that, but if there is one thing I have learned from bike racing, it is that you make a decision and you commit to it. You make a move and you *bleep*-ing commit to it. You can’t second guess yourself, and I’m not going to do that with Strava. Will I join Strava again at some point in the future? Probably, but for now I think this time away from Strava and Facebook and Twitter (see next section) will be very good for me and my family. It already has been. On my ride today, I got 3 real in-person kudos from the people that matter the most to me. I already mentioned in the TL;DR that my Facebook and Twitter accounts were collateral damage, and I realize now that if I really go into all the details of why beyond my original summary at the top of this blog I will be stepping into personal areas that I really don’t want to share with other people. So let me recap again that because of the Strava Instagram integration and how many positive comments I was receiving about how cool it looked to ride where I was riding, etc… I started thinking that the whole world wanted to see my rides. So I started crossposting all my pics to Facebook / Twitter and pushed away a number of real life friends. As an extreme measure to prevent myself from cross posting to Facebook and Twitter, I deleted those accounts – which was a sure-fire way of not spamming people any more with all my Instagram posts. Was there a more reasonable approach? Sure, but I wasn’t making reasonable decisions. Will I be back on Facebook? Yes, my account is only suspended and probably at some point in the next couple months, I will reactivate it so I can communicate with people who that is my primary form of communication. Will I be back on Twitter? Probably not. I never posted anything to Twitter that I didn’t crosspost somewhere else. I do know that there were a lot of people on Strava who looked forward to seeing my pics and rides, that gained inspiration from what I was doing. I know this because I received those kinds of comments both in person and online frequently. If this is/was you, then I am very sorry for just pulling the plug so suddenly on what may have been a source of inspiration for you. I am working on updating topocreator.com and howmuchtogo.com so that I can embed my latest rides on this blog and in an RSS feed. I know it’s an extra step, but it feels like staying away from Strava for at least a year if not longer is something that I need to do for me and my family. Once all of this is ready, I will post another blog (The Path Forward II or something like that) with details of how you can see my rides and data. This entry was posted in Adventure, Misc, Racing, Training and tagged strava on February 1, 2016 by kartoone. Quick post here … I took back the Smyer to Shades Crest KOM today. One of the things about that climb is that it is has been on my commute route home from work for the past eight years. Before I ever had a GPS I used to time myself with a very basic bike computer. I kept track of a backpack time and a non-backpack time. The segment doesn’t match if you are coming up from the 280 side (which I do quite often) so Strava only shows me as having done the climb 126 times — but I would guesstimate the number closer to one thousand times especially considering my pre-strava commutes from 2005-2008. I know that climb well enough to possibly do it with my eyes closed … actually I’ve experimented with that a few times and ridden sections of it with my eyes closed just for fun. A few weeks ago Paul Tower took the KOM from me with an amazing time of 2’33”. A few days later I was able to put in an effort on the climb to try to take it back, but I ended up falling quite a bit short (2’37”). Just four seconds … but for such a short climb that is pretty much an eternity. Not racing this past weekend, I needed to get a good hard effort in to wake my legs up for this weekend’s Mississippi Gran Prix so it worked out for me to try again today. This time I started from a cross street instead of lower down on the hill … and that made a huge difference. Combined with a little bit of GPS love (i.e., the Strava segment matched up a bit early b/c my GPS track was offset a bit to the right at the end) led to a smashing of the old record with a time of 2’25” … almost 20mph. Smyer to Shades Crest KOM … 2’25” @ 484 watts, VAM 1500 on a 5% climb. This entry was posted in Training and tagged kom, strava on April 10, 2013 by kartoone.